PATTERSON, Roscoe Conkling, a Representative and a Senator from Missouri; born in Springfield, Greene County, Mo., September 15, 1876; attended public and private schools, Drury College, Springfield, Mo., and the University of Missouri at Columbia; graduated from the law department of Washington University, St. Louis, Mo., in 1897; admitted to the bar the same year and commenced practice in Springfield, Mo. ; prosecuting attorney of Greene County, Mo., 1903-1907; elected as a Republican to the Sixty-seventh Congress (March 4, 1921-March 3, 1923); unsuccessful candidate for reelection in 1922 to the Sixty-eighth Congress; resumed the practice of law in Springfield, Mo. 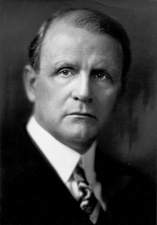 ; presidential elector on the Republican ticket in 1924; moved to Kansas City, Mo., in 1925; United States district attorney for the western district of Missouri 1925-1929, when he resigned; elected as a Republican to the United States Senate and served from March 4, 1929, to January 3, 1935; unsuccessful candidate for reelection in 1934; chairman, Committee on Mines and Mining (Seventy-second Congress); resumed the practice of law in Springfield, Mo. ; member of the Missouri Appellate Judicial Commission; died in Springfield, Mo., October 22, 1954; interment in Maple Park Cemetery, southeast of the city.